Cougars are large cats that lurk in the forests or prowl the plains, stalking its prey from a distance and then ambushing when the opportunity is right. They generally avoid civilization and people but they will fight back when provoked. 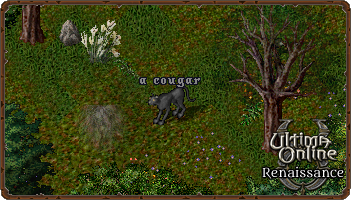 Cougars can be taken as pets by even novice animal tamers, though one should do so cautiously. Though, typically only hunted when they become a menace, cougars can be a source of meat and hides. However, they do not exist in large enough populations to become a sustainable source of those resources.